Seeking to expand its market presence and drive business growth, a UK-based company turned to Iflexion for development, maintenance, and support of their core digital marketing tool. The Customer is a UK-based provider of innovative recommendation and referral digital marketing solutions for retail, recruitment, and online gaming. Their core product provides an automated social network referral platform that allows companies to promote their products, services, and job openings. To upgrade the application with the constantly growing popularity, add new features and services, the Customer was looking for software development professionals to team up with their in-house distributed development team. Thanks to our successful collaboration in the past, the Customer chose Iflexion as a reliable long-term technology partner. The application leverages the power of social networks in order to help companies to improve sales, grow their customer base and recruit the best talent. By rewarding users for making personal recommendations and promoting products on social networks, this application motivates users to do a great deal of the marketing staff’s job. When making recommendations, users collect points and receive reward payments that are processed automatically. The solution uses the client's contact database to promote products successfully to new and future customers, using the current contact database. The current customer database is leveraged to find a new audience, using the social network connections of the existing contacts. This is a passive audience, which may not be ready to purchase immediately, but can be nurtured until they qualify for a sales contact. The data sources utilized include Hotmail, Gmail, and LinkedIn, amongst others. 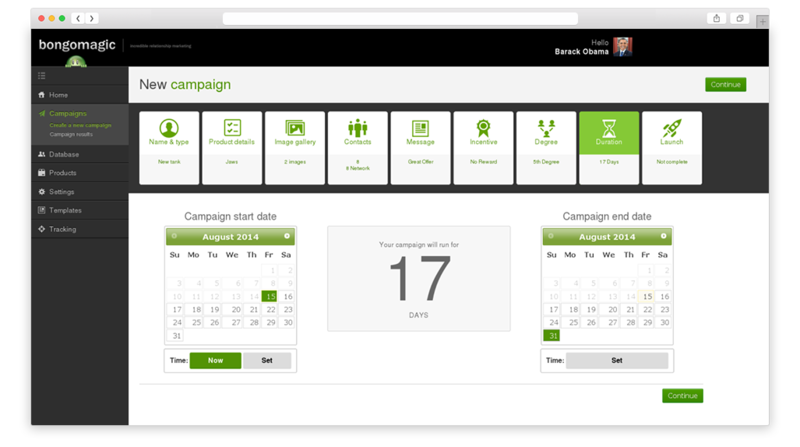 The simple-to-use UI of the campaign management mechanism enables even the most inexperienced user to plan and design an attractive and dynamic online marketing campaign. By combining contacts, services, products and vacancies, and uploading descriptions, images and videos, users can either immediately launch campaigns or schedule them for a later date. Thanks to the advanced BI engine, the application gives visibility and transparency to the underlying information of the marketing campaigns. The ROI of each campaign is reported on by an intricate analysis of customer data (customer activities, incentives, etc.) followed by the creation of a set of custom reports that provide comprehensive information on the campaign's overall effectiveness. The system is designed to incorporate faultlessly into the existing business canvas. The need to transfer information manually between the database of the portal and the supporting internal systems has been removed. In line with the Customer’s marketing software development requirements, the solution can seamlessly integrate with support systems for sales processing and job applicant tracking, as well as with CRM, ERP and intranets. The application uses personal customer data, which must be protected. For this reason, Iflexion's team put special effort into developing comprehensive information security, delivering a customized data encryption framework for the solution. As the Customer approached Iflexion with a clear vision of the solution, the team was involved throughout the marketing software development stage with ongoing integration, testing, maintenance, and support. The development process was organized in the most cost and time-efficient way, within the dedicated team collaboration model. Iflexion's team managed to easily integrate into the client’s existing processes, utilizing Agile methods and keeping up with priorities identified in daily communication. The challenging points of the development process were discussed collectively and resulted in a variety of approaches to problem resolution, but it was the client who made the final decision on the idea to follow. At present, the major part of Iflexion’s activity is dedicated to the implementation of custom features on the end users’ individual request (specific links generation, database content encryption, etc.). Engaged in long-term collaboration, Iflexion’s dedicated team aims to solve these constantly emerging tasks. After a couple of months of fruitful collaboration, our customer requested the inclusion of an application for Facebook into the suite. This would expand the reach of the solution, resulting in an increase in the total number of users. The overwhelming global engagement of Facebook ensured that the deliverable provides a new avenue for strengthening end-user-to-customer networks.The program suite is based on the web portal functionality, with considerable expansion of its integration with Facebook – migrating from simple posting of marketing campaigns on a Facebook wall to the mass sharing of services, products and job openings with some or all friends. In addition, the Facebook application helps the client’s customers with improved ways to keep themselves informed about the changing interests of target audiences, by collating statistics on most commonly viewed, shared and liked posts. Nowadays, Iflexion’s team is engaged in both the app development and the web portal upgrade. Generating new customers and improving retention rates by using an existing customer contact database. Finding good quality candidates and automating users employee referral program. Generating new and more receptive customers and players for the online gaming, betting and gambling industry sectors whilst at the same time significantly reducing digital marketing costs. Iflexion is maintaining the system's performance and technical evolution.